KIEV, Ukraine -- Ukraine will invite foreign observers to prove its parliamentary elections in October are free and fair, a Foreign Ministry spokesman said Monday in response to criticism from European Union nations. Foreign Ministry spokesman Oleh Voloshyn. 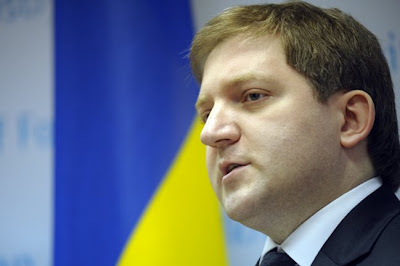 Oleh Voloshyn said the government understands that free and fair elections is a “red line” that cannot be crossed without seriously worsening relations with the EU. “The key message is that we understand that the red line, or to put it mildly, the key characteristics by which the level of Ukrainian democracy will be measured, is the parliamentary elections,” Voloshyn said in an interview with Channel 5. Britain, Sweden, Germany, Poland and the Czech Republic, in a joint article written by their foreign ministers and published by The New York Times over the weakened, said that a key political and trade deal with Ukraine had been blocked by Kiev’s apparent crackdown on opposition leaders. The ministers also said the relations between the EU and Ukraine will further deteriorate in October if the government blocks the opposition leaders from running for seats in Parliament. The article, signed by William Hague, Carl Bildt, Guido Westerwelle, Radoslaw Sikorski and Karel Schwarzenberg, respectively, is the strongest yet criticism of the Ukrainian authorities since Viktor Yanukovych had won the presidency two years ago. The article came days after Yanukovych has ordered Prime Minister Mykola Azarov to make sure that Ukraine was ready by April 2 to sign the political association and trade agreement. The prospect s for the deal further worsened last week after Yuriy Lutsenko, a former interior minister in the Tymoshneko government, was jailed to four years in prison for alleged abuse of power. “These developments are incompatible with Ukraine’s own European choice,” the ministers wrote in the article. Ukraine will have its next political test in October at upcoming parliamentary elections, and should the authorities fail to allow the opposition leaders to run for seats in Parliament this may significantly deteriorate relations between Kiev and Brussels. The comments by Voloshyn reflect Ukraine’s official response to the article that will be published soon by the International Herald Tribune. “The response will be in the form of an article,” Voloshyn said. Great post, Well done! thank you for the efforts you have made in writing this article.. Please Keep posting..
Great post! Looks cool the work you do...I've been looking for something like this for a very long time. The information you show us is interesting for everybody .. I hope this works for me. Thank you for sharing!